Have you ever travelled to a beautiful body of water and felt the urge to explore even further? A houseboat rental vacation allows you to do just that. You can experience solitude, relaxation and exploration at your own pace. Technically Lake Powell is a Colorado River Reservoir, but the fact that humans had a hand in its creation adds to its allure. There is a contrast between sparkling blue waters and the arid, rocky shores that creates a stunning dichotomy, and a houseboat is one of the most unique ways to experience this setting. Navigate around steep sandstone cliffs, experience world-class fishing or spend an afternoon lounging on the beach with explorers from around the country at this awe-inspiring escape. 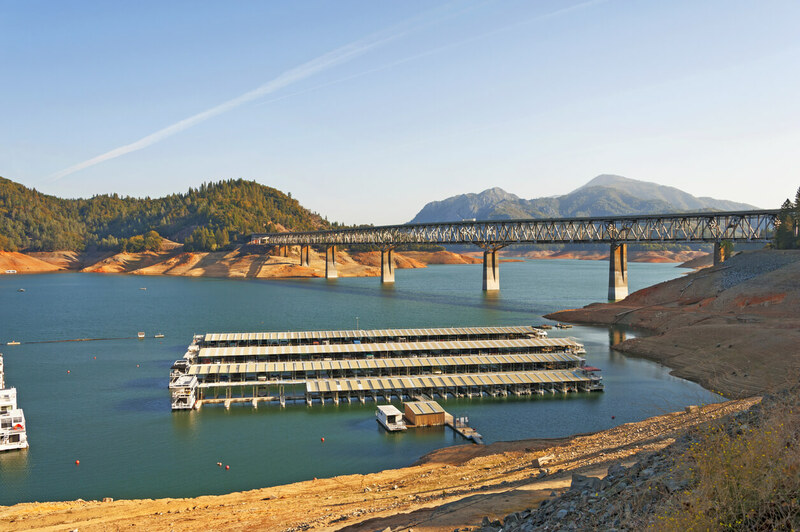 One of the most popular houseboating destinations in the world, Shasta Lake in Northern California provides countless opportunities for adventure. Shasta Lake is another river reservoir that’s impounded by the Shasta Dam, the second largest concrete dam in the nation. Other places to explore include narrow coves surrounded by alpine terrain, the Sacramento River trail and the otherworldly Shasta caverns — a network of limestone caves with dazzling formations that hang like chandeliers from above. Among the country’s natural hidden gems are the Finger Lakes in the state of New York. These lakes combine the incredible natural scenery of waters formed by glaciers with an extensive history that began with Iroquois tribes who used the lakes for travel and sustenance. In later times, engineers built canals that connected the lakes, creating a handy way to navigate each finger-shaped body of water. These lakes are in an important wine producing region, so houseboaters can dock at the nearby vineyards and sip the local offerings on the water as the sun sets. One of the most strikingly beautiful destinations in the Midwest is Lake of the Ozarks in central Missouri. Located within the inspiring Ozark Mountains, this lake winds its way through mountainous terrain and branches out into secluded arms worth exploring. With an astounding 1,150 miles of shoreline, this lake is ideal for anyone who wants to catch a glimpse of pristine land and water ecosystems. From your houseboat, you can visit Ha Ha Tonka and Lake of the Ozarks state parks. These natural attractions are home to hiking trails, caves and even the ruins of an early 20th century mansion built to resemble a European castle. We couldn’t make a list of the best houseboat vacation destinations without including our beloved Rainy Lake in Voyageurs National Park. There is incredible ecological diversity in the park, which lies at the convergence of deciduous northern hardwood forest and southern boreal forest biomes. There are about 900 different species of flora in the national park, most of which you can observe from the comfort of a houseboat. Like the Finger Lakes in New York, Rainy lake was shaped by glaciers. In fact, the water below every houseboat was once locked into massive ice formations that advanced and retreated depending on global climate patterns. If you’re interested in seeing a place that feels much like it did before human settlement, Rainy Lake is for you. The key to finding the ideal houseboat destination is understanding what each location offers and deciding whether it checks the right boxes for what you want out of your trip. Rainy Lake has points of interest for visitors of all ages. Contact our team to reserve a houseboat and see all of them.